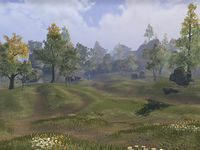 The Aldmeri Territory in Cyrodiil initially comprises the southwesternmost regions. The six keeps that make up the initial defenses of the Aldmeri Dominion are all located here. In addition, the towns of Vlastarus and Hackdirt can be found here, in the western section. The Imperial City lies across Lake Rumare to the northeast, but is inaccessible. The Daggerfall Territory is separated by a mountain range to the north on the western side, through which there are three gated passes. The Ebonheart Territory lies east across the Niben, passable via three defensible bridges. 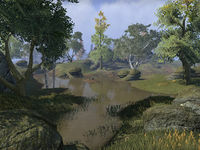 Swimming across the river or Lake Rumare is inadvisable, as they are both rife with Slaughterfish. There are three Dolmens here; Great Forest Dolmen and Greenmead Dolmen are found in the west, and the Nibenay Valley Dolmen is near the river in the east. The Bloody Grasslands are situated in the northeast of the territory, southwest of Castle Alessia. The region is comprised of rolling fields and scattered trees and interspersed with the odd rocky outcrop. The region borders Lake Rumare at its northern end, where a bridge to the Imperial City can be found. 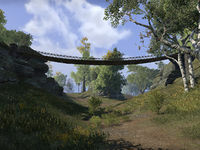 The bridge is inaccessible due to the Daedric invasion, but an entrance to the Imperial Sewers is located just to the east along the shore. Sardavar Leed sits just to the west of Alessia, while The Atronach Mundus Stone is in the south of the region. The Colovian Lowlands region lies between Castle Black Boot and Castle Bloodmayne in the south of the territory. The region contains rolling hills and valleys and descends from the northwest to the Larsius River in the south. A road runs along the northern edge of the region from Black Boot to Bloodmayne past Castle Faregyl, from which a second road heads north. Pothole Caverns is located on the south side of this road. The Apprentice stone and the Ayleid ruin Wenyandawik are located in the center of the region, while Clearwater Camp and Bloodmayne Cave sit beside the Larsius. The Great Forest sits northwest of Castle Roebeck. 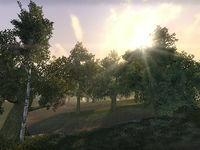 A large wooded region, the Great Forest also contains the Imperial Nikel Outpost and a number of roads that lead south from the Daggerfall Territory border towards Castle Brindle and Castle Roebeck. The Great Forest Dolmen can be found in the north of the region, to the west of which sits Breakneck Cave. Haynote Cave opens out onto the southbound road to Vlastarus, just south of which is the Ayleid ruin Ceyatatar. A second Ayleid ruin, Narsinfel, is in the northwest of the region. In the west, just outside Castle Brindle, the road passes near Gottlesfont Priory, Wooden Hand Outlook and The Warrior Mundus Stone. Green Leaf Glade lies in the center of the region. Greenmead is the region southeast of Castle Brindle and north of Vlastarus. The area is littered with old Imperial ruins nestled among the trees. A north-south road runs through the region from Ceyatatar past the Greenmead Dolmen and the village of Vlastarus to Nornalhorst. Just west of the village sit the eponymous Vlastarus Towers. The North Weald is situated northwest of Castle Faregyl and southwest of Castle Roebeck. A primarily agricultural region, the North Weald contains a number of abandoned farms. A road running down the eastern side divides this region from the Bloody Grasslands, on the western side of which sits the Gray Viper Outpost. At the northern end of the region, where the road joins the Red Ring Road, the small village of Pell's Gate can be found. 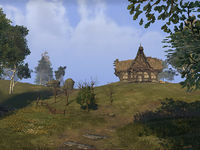 The Ayleid ruin Vindasel lies just outside Roebeck Farm. The Northern Niben Valley is the region south of Castle Alessia and north of Lunar Fang Docks on the western side of the Niben River. A number of secluded ponds can be found among the hills and valleys inland from the river, while the Green Road runs down the bank. 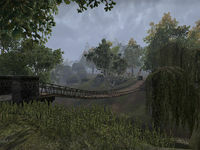 The Culotte Bridge to the Ebonheart Territory spans the Niben just east of Riverwatch lighthouse. Atop the hills south of Riverwatch lie Moffka's Lament and Variela's Watchtower. The Southern Niben Valley is the region northeast of Castle Bloodmayne and south of Lunar Fang Docks on the western side of the Niben River. The region descends southeastwards through rolling hills to the shores of Niben Bay. 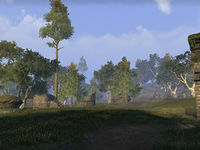 Spurs of the Green Road cross the region from Bloodmayne leading northwards, one of which leads across the Niben Bridge and into the Ebonheart Territory. The Nibenay Valley Dolmen sits in the center of the region, with Beriel's Lament just south of it. The Ayleid ruin Anutwyll lies on the shore of Niben Bay across from Bravil. 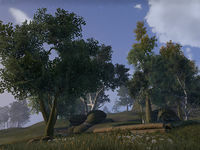 The Southern Woodlands can be found south of Vlastarus and north of Castle Black Boot. The woodlands are a source of lumber for the logging industry, and a number of felled trees can be found in the area. A road runs southwards through the region from Vlastarus to the Abbey of the Eight, just beyond which sits the Abbey's lake, Blessed Water. On the western edge of the region lie Howling Cave and Silverscale Pond, as well as the Ayleid ruin Nornalhorst. A second Ayleid ruin, Juras' Fall, can be found in the east of the region. A secluded grove, Mist Mirror Refuge, lies in the south of the region, above which sits Thalara's Winery. Nisin Cave can be found just to the north. Beyond that, in the center of the region, a number of ruined buildings surround the Abandoned Orchard, just to the west of which stands The Lady stone. 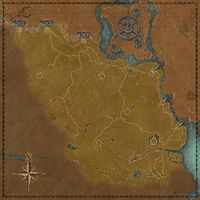 The Southwestern Shore of Lake Rumare runs from the border with the Daggerfall Territory around to the bridge to the Imperial City at the northern tip of the Bloody Grasslands. 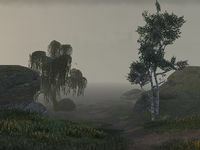 Covered in a perpetual mist, the southwestern shore encompasses the Ayleid ruin of Fanacasecul as well as the contemporary ruins at Virtue Outlook and Homestead Ruins. Western Rise is situated in the northwest of the territory, north of Castle Brindle. The region is named such for being the foothills of the Colovian Highlands which rise away to the west. A fault line runs along the eastern edge of the area across which a number of bridges provide access to the Great Forest. Serpent Hollow Cave is at the western end of one of these bridges. A road runs south through the region from the Chorrol Milegate on the border with Daggerfall Territory, past the Carmala Outlook to the village of Hackdirt. 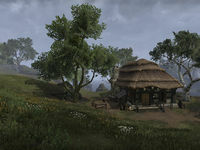 The village has been overrun with Black Daggers, and the former residents can now be found at a Refugee Camp just north of Brindle.